Roll away the stone! Christ is risen! Happy Easter, my friends! What were their reactions? Initially they were scared. I’m sure they were speechless, too. The angel asked later, “why do you seek the living among the dead? He is not here, but He has been raised. Remember what He said to you while He was still in Galilee, that the Son of Man must be handed over to sinners and be crucified, and rise on the third day.” Bam. John tells us they were perplexed. Completed baffled. Why were they experiencing those feelings? Well, maybe because they just realized that everything Jesus said to them before His Passion actually happened. They were perplexed. They were terrified. Still puzzled, but astonished. It all made sense…? Wait a minute. This mix of emotions brought the women rushing to tell somebody! So, they told the apostles. But before I get to that part, what might be the reason of women being the first witnesses of the Resurrection on Easter morning? Let’s rewind really quick earlier in Christ’s life…to the very beginning: His Nativity. The proclamation of the angel of the Messiah was first given to the shepherds on the field. As we all probably know, the shepherds were poor and simple. It’s a common thread in the Bible that God came to shepherds and simple, poor people because He favors the lowly. In their simplicity, the shepherds believed and made their way to the manger. This is similar to the Resurrection. Women, in those days, were looked down on and Jesus of course loves anyone who is humbled by the pride of men… after all, God took the form of a human. He is the epitome of humility. The women were very simple and their goodness of their faith led them to the Apostles, as Jesus told them to. The apostles doubted when the Good News was first shared. We all know it look a little more explaining and visual proof that Jesus was among them again. 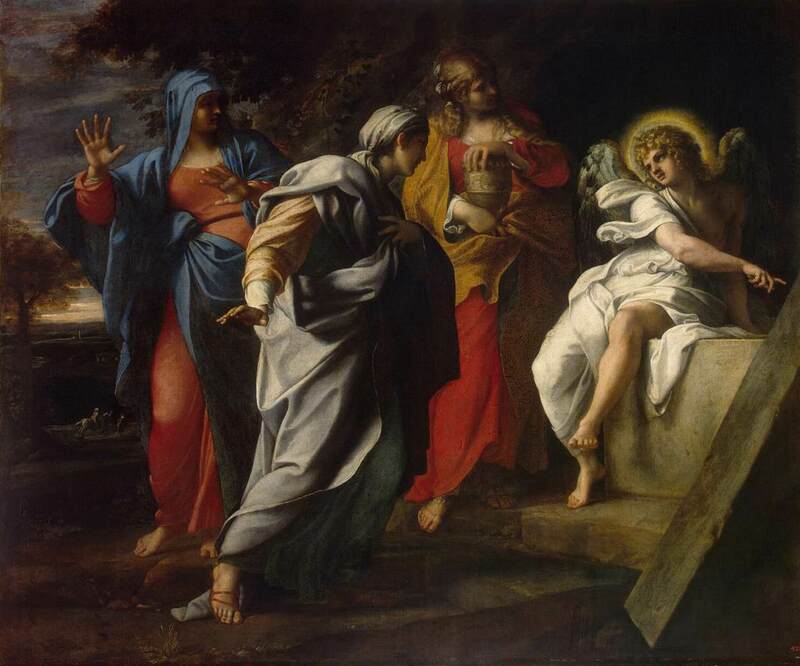 But before that, Peter ran to the tomb, saw the linens, and went back home wondering what had happened. John says he was amazed. He was overwhelmed with wonder. How does their reaction/action compare to ours? If we have experienced the Resurrection of Christ, why at times do we still dwell in our sorrow or in the darkness when He brought us new life in Him? Of course we were not physically there when it happened, but the Gospel is alive every time we hear it spoken at Mass or any time we read it. Those words, too, have everlasting life and it’s important that we bring those living words to life in our own vocations. Take time to reflect on this Gospel message where God has placed you at the moment, as a: wife/husband, mother/father, sister/sister, youth or campus minister, daughter/son of God. How does this pertain to you? What have you done or could you do to help others understand this great message of hope that is life-changing? These women understood what happened when they realized that everything that Jesus had told them was absolutely true (I still find myself in complete awe). Perhaps they didn’t necessarily doubt what Jesus was saying; it is our human nature that makes us think that it’s impossible because we know it just can’t be. But, God is, well, God, and He made it happen and gave us something incredibly amazing. We may not deserve it but He is constantly offering it. What can this be? The gift of new life. If you receive a gift that is absolutely amazing, you’re not going to keep the excitement all to yourself and not share they joy you are experiencing, right? Try to think of it this way. Let’s go with something along the lines of meeting your dream woman or man. Picture yourself just sitting down in, let’s say the doctor’s office, and all of a sudden, you notice a very attractive woman/man walking past the door. S/he ends up entering the room, asks a question, then eventually engages in this amazing conversation with you, you realize how s/he fulfills every single one of your requirements for your perfect (wo)man, but better. This dream (wo)man of yours exceeds perfect by infinity. Are you working with me? The Risen Christ’s gift of new life can and should be seen in the same way. In fact, Christ IS ultimately our perfect man, if you know what I mean. But, going back to the analogy, it would be unheard of if you kept all of this exciting, unbelievable, yet real news all to yourself. As a woman, I’m sure I can all trace back to the times when I just wanted to tell all my girlfriends about awesome girly things. I’m sure guys can relate in their own ways. It’s our nature to act that way. So, too, must we constantly remind ourselves that this is exactly how it should be with the Risen Christ who gives us His amazing gift of new life. There are three contrasts built in the story of the Resurrection that I quickly want to share. Darkness to light, absence to presence, silence to speech. At Christ’s Crucifixion, darkness enveloped the earth. However, three days later the Resurrection brought the light of the Risen Son/Sun. God overcame darkness and death. We also have absence to presence. 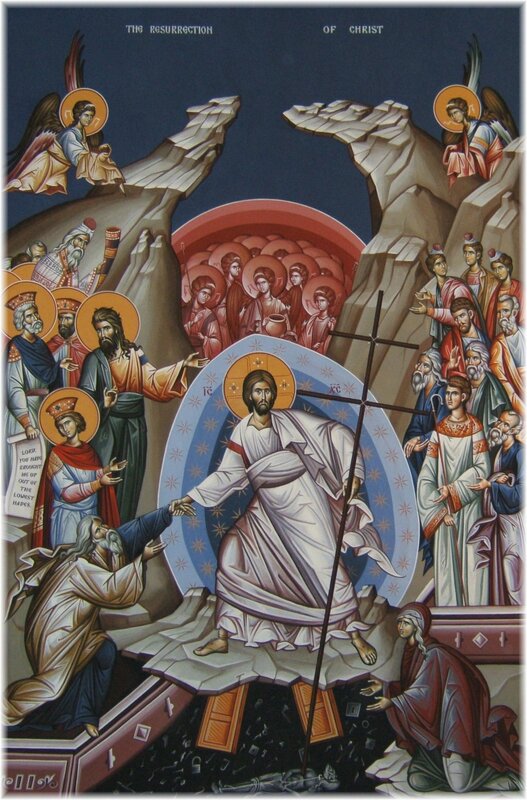 The entering of the tomb and finding an absence of the body is set over against His personal presence; He appeared to so many after He rose and before He ascended into Heaven. Lastly, silence to speech. This silence first refers to the women after they were told He is risen. The angel proclaims what had happened and they said nothing due to possibly fear. But between wonder, joy, and fear they stood and found no words to say. Soon after, though, the truth in what they heard then caused them to proceed in telling the Apostles of what happened. We can’t keep this to ourselves. We just can’t. Christ’s Resurrection is the sure ground on which our faith is based. Our faith only makes sense if Christ is alive. Not only is Christ’s Resurrection the basis of our faith, it is also the source of our hope that we, too, will rise. We must leave behind us the doubts that we haven’t been saved. St. Paul in 1 Corinthians 15:13-18 writes “If Christ has not been raised, your faith is futile and you are still in your sins.” We know for a fact that this isn’t true. We have to embrace the truth of the Gospel in the Resurrection of Christ. Our faith cannot exist without this doctrine. The Resurrection is the “new creation” and it is immeasurable by time. It’s not a coming back from the dead that Jesus did, but it was a going beyond death. The Resurrection is the entrance into the life of God, the Risen One can never die…and that’s what He offers us. In the beginning, I tried to put emphasis on the feelings experienced and the emotions shown. I did that because I wanted to show how natural it is for us humans to think so realistically. We often times put our faith down because things really seem impossible. The words “He has been raised” sent shock to humanity because the impossible had happened. Life had been born out of the grave. A new message was given to humanity. The message proclaimed in the Gospel that Christ is alive is the great truth which fills our faith with meaning. He as triumphed over death; he has overcome sorrow, anguish, and the power of darkness. Instead of the order of birth, life, death, and corruption, it is now birth, life, death, and eternal life. When we are given a gift, we use it, I hope. Sometimes when we don’t get things we like, or rather, when we receive something we may not want, but need, it just sits in the corner of our room, untouched and catching dust. But with this gift of new life, we can’t do that. Isn’t this amazing gift worth sharing to every person we meet? At times we may not want this gift especially when we are feeling unworthy, but we need it, desperately. Furthermore, one of my favorite stories in the Gospel after the Resurrection in particular is Jesus’ appearance to the two disciples on their journey to Emmaus (Luke 24:13-35), which was seven miles away from Jerusalem. During their walk they were conversing about all the things that happened. While they were conversing and debating, Jesus drew near and walked with them, but their eyes were prevented from recognizing Him. He then asked the two what they were discussing and they responded, but looked despondent. The two shared with Jesus (still, without recognizing it was Him) all the events that happened to Jesus the Nazarene and everything that He said He would do to redeem Israel. Because they were downhearted, Jesus patiently opened for them the meaning of all the Scriptural passages concerning the Messiah. Once evening came, they reached their destination and Jesus was about to continue down the road, but they insisted He stay with them for the night. They didn’t want Him to leave yet. Suddenly, while Jesus was at the table with them, He took bread, said the blessing, broke it, and gave it to them. Their eyes were opened and they recognized it was Him, but then He vanished from their sight. In the course of their conversation with Jesus, their sadness turned to joy and renewed hope, and felt the need to share their joy with others. They became heralds and witnesses of the Risen Christ. This shows another example of the zeal of the women who shared the Good News to the Apostles. This also shows the zeal of Christ for souls. Christ met two men who have nearly lost all hope. Christ understands their sorrow, sees into their heart, and communicates with them some of the life He carries within Himself. When Jesus was going to leave originally, we see that the two are saddened by His departure from their presence. They, without noticing it was Christ, were so deeply stirred by the words shown by God made man. The Lord never forces Himself on us. He wants us to turn to Him freely, when we begin to grasp the purity of His love which He has placed in our souls. This ties into the gift we have in the Eucharist, Christ’s true presence! Isn’t that so crazy and beautiful at the very same time? We have the gift of the Eucharist because we have a God that told us He would never leave us. As previously mentioned, women were looked down upon in Jesus’ time. It’s important to understand that the Lord chose them to be the first witnesses because of their simplicity, humility, and goodness, all of which we find in the Eucharist. The Lord of all creation is contained in a small host. Can that be any more simple or humble? And how much goodness can flow from receiving Christ at Holy Communion and by spending intimate time with Him in prayer? The time we spend with Him in His Goodness can also move us to respond to immediately. The Eucharist is the Risen Christ. Therefore, the Eucharist makes the Resurrection present and active in our lives and enables us to experience the joy and power of the Resurrection. Obviously we were not present at the Resurrection, but through the Holy Sacrifice of the Mass or during Adoration, we have the opportunity to personally encounter the Risen Christ. Again, what a beautiful gift. Shouldn’t we be telling the whole world about this? To conclude, Easter isn’t just a message we reflect on during the Easter season, although it seems that we make it that way. Easter is a time of joy but it is not confined to the period of the liturgical year. St. Augustine said, “Do not abandon yourselves to despair. We are an Easter people and hallelujah is our song.” We need to own this truth that the Light belongs to us every moment of our lives. We need to remind ourselves that the Resurrection wasn’t just a happy ending to Jesus’ story, but a radical new beginning for Him and for us. Eternal life for Jesus and for all of humanity was born in the grave. Easter should always be present in the heart of a Christian. It is who I am. It is who we are. I challenge you to reflect on how you can truly be filled with Easter joy as you live out your vocation in life—how can I spread it to my wife/husband, my children, my young people, my community, my family, and friends? How I can share this with strangers on the street, at my workplace, or with people who don’t even know God? It helps to unite our heart with Christ’s zeal for souls, that way our only goal of wanting Heaven for them will be evident in all that we do. Easter is the story that lives forever.